David Clifford is back in the Kingdom squad. FORMER FOOTBALLER OF the Year James O’Donoghue and All-Star forward David Clifford are both big-name additions to the Kerry panel for tomorrow’s Division 1 meeting with Mayo in Tralee. 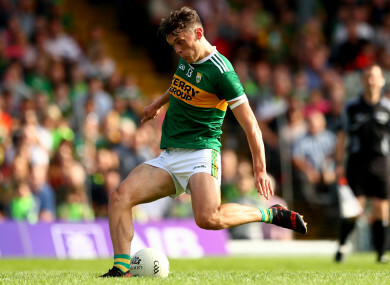 Neither man has kicked a ball yet in the 2019 campaign as they work their way back from injuries, but the return of the attacking pair to the bench will greatly strengthen Peter Keane’s hand against the 2017 All-Ireland finalists. The Mayo team shows three changes from their defeat to Galway two weeks ago. Michael Plunkett, Conor Loftus and Kevin McLoughlin come in for Lee Keegan, Colm Boyle and Darren Coen. The game at Austin Stack throws-in at 7pm. Email “Clifford and O'Donoghue return to Kerry squad for Mayo clash”. Feedback on “Clifford and O'Donoghue return to Kerry squad for Mayo clash”.